Beginning to Intermediate. Composed by Elysa and Jason Hochman. Saddle-stitched, Flamenco, Solos. Style. Book and online audio/video. 72 pages. Mel Bay Publications, Inc #30669M. Published by Mel Bay Publications, Inc (MB.30669M). ISBN 9781513461380. 8.75 x 11.75 inches. 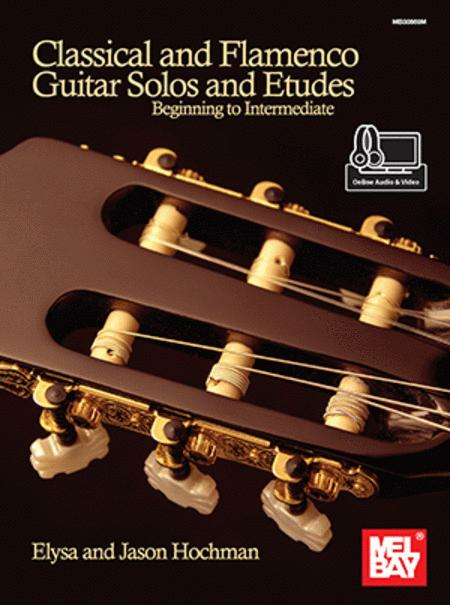 Classical and Flamenco Guitar Solos and Etudes provides an introduction to classical and flamenco guitar techniques through 22 pieces. These short, melodic studies will increase your understanding of chord/harmonic shapes, and encompass a variety of styles: vals, classical etudes, malaguena, solea, rumba, farruca, and bulerias. The five main techniques in classical and flamenco guitar are: pulgar (thumb rest stroke), arpeggio, picado (index and middle alternating strokes), rasgueo (strumming), and tremolo (flamenco) - which are applied throughout this book. Includes access to online audio and video.